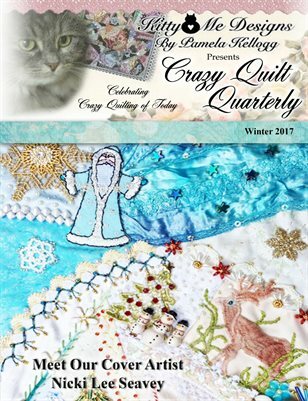 The Winter 2017 issue of Crazy Quilt Quarterly magazine In this issue of CQQ, we’ve shared the 8 beautiful blocks we received for our 2018 calendar contest. Our contributors were all kind enough to share with us, a short biography which we have included with their blocks. Also in this issue is a charming vintage crazy quilt jacket owned by Lesa Farmer. We have some beautiful quilts by Genevieve Tracey, Cris Ruckman, Mary Anne Richardson and Deb Hardman. And be sure to see the sweet little Christmas ornaments by Darlene Kliewer. Oh yes, and a gorgeous heart by Betty Pillsbury! Finally, be sure to check out our Artist Trading Card swap and last but not least by any means, don’t miss reading about our cover artist, Nicki Lee Seavey!! !